If you want to get better in your game, practice is necessary. But would you always have the time and energy to take a trip to a golf course? You don’t need to be a professional golfer so you can enjoy playing golf right in your yard. With the help of artificial turf, your yard, regardless its size, can be transformed to your very own playing field. A backyard putting green is an artificial turf area custom made for you. The surface makes for a realistic playing surface and installation also costs lower than maintaining a natural grass. Watch this video for a step-by-step information on synthetic turf putting green installation. Another thing that’s great about an synthetic turf putting green is that you never have to leave home when you want to practice. Surprise another golfer how better you’ve become. You can even use the space to play with your kids or just hang out the entire weekend. The synthetic turf putting green is a practical choice for many reasons. Low-maintenance. Not everyone enjoys the maintenance work involved in keeping a green lawn. Nor does everyone have the skills and experience caring for green live grass. For some homeowners, keeping their lawn consequently means hiring a gardener. With artificial turf, you no longer have to worry about working hard cleaning the yard. You can instead focus on your game. When you no longer have to make use of mowing equipment and invest on fertilizers, that would also mean reduced expenses. Durable. The synthetic turf is designed with extreme durability. Regardless the weather condition, it’s bound to stay green year round. You will not have to encounter annoying brown bald spots in your yard. This surface wouldn’t wear and tear even with regular use, even when you let the four-legged family member run around it. Eco-friendly. Artificial turf does not require fertilizers and even water to keep it looking great. You can prevent fertilizers from running off your drainage systems. You wouldn’t need as much water as keeping real grass. Same feel. Playing in an artificial turf putting green offers the same thrill as playing on a real golf course. The look and feel of the synthetic grass simulates that of a real grass so you will not feel any difference when practicing. Accessible putting green so you can practice anytime you want. Similar performance as a real golf course. You no longer have to pay each time you want to play. Now you have another reason to transform your unused yard spaces to something more functional and enjoyable. 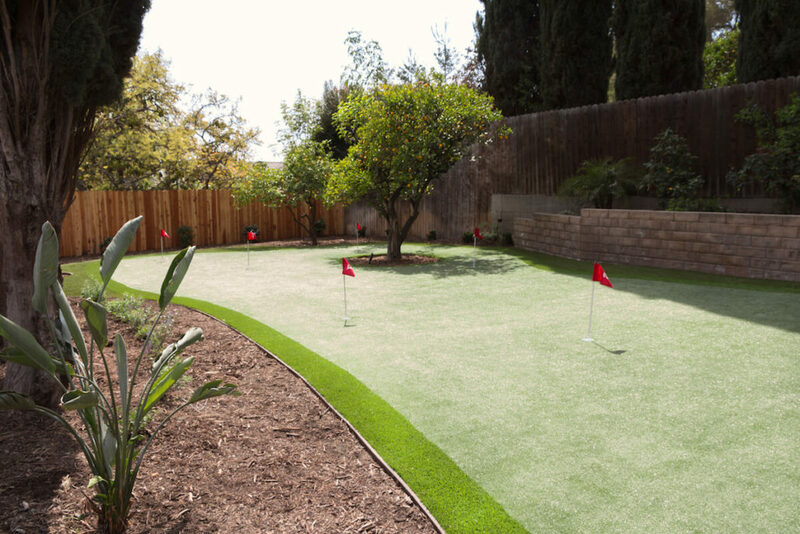 Here’s to creating wonderful memories at your backyard with a synthetic turf putting green.